An architectural plant with dramatic flower spikes in late summer and attractive evergreen leaves all year round. Plants grow to a height of about 1m, and up to 4m including flower spikes. They look good in borders, City gardens, Mediterranean and coastal gardens, and in larger containers. The leaves are serrated and make a good security barrier as they hard to climb over! 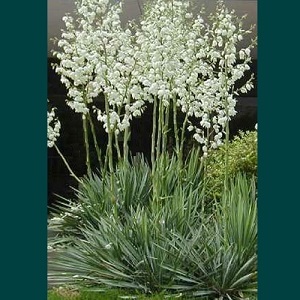 Needle Palms grow best in a sheltered sunny position in well drained sandy soil. They are low-maintenance and long lived. They spread naturally by suckers and self-seed in the right conditions. 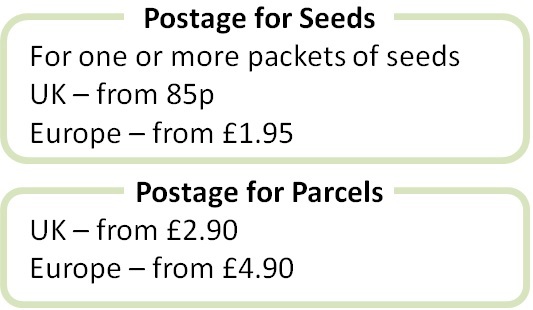 Pack of 15 seeds. Sow anytime, typically spring to autumn. Plants grow slowly at first and take three to five year to reach flowering size, but make good sized clumps once established. Sowing instructions and a colour photo are printed on the packet. Sow anytime, typically spring to autumn. Soak the seeds in hand-hot water overnight and then sow the seeds 1mm deep into a tray of seed compost. Keep the tray at a warm 20-24°C and germination takes 3-4 weeks, sometimes erratically over several months, so do not discard the seed tray too quickly. Protect later sowings in a greenhouse or cold frame over the first winter. Plants take time to mature and flower in 3-5 years. This is an evergreen plant and needs little maintenance once established. Cut back dead flower stalks and remove any untidy leaves as necessary. Mature clumps can be divided in autumn after flowering by removing rooted suckers from the base of the plant. If you wish to collect seed, you may need to hand pollinate the flowers as the plants originate in North America and do not have natural pollinators in Europe.